Chaïm Soutine was born to a poor Jewish family, the tenth of eleven children, in the shtetl of Smilovitz, and drew from an early age. He studied at the School of Fine Arts, Vilna (1910-13), and in the Atelier Cormon at the École des Beaux-Arts, Paris (1913–15), becoming closely associated with the group of foreign-born, predominantly Jewish artists, known as the 'École de Paris'. The majority including Marc Chagall, Isaac Dobrinsky, Jacques Lipchitz lived and worked together in great poverty in the studios known as La Ruche ('the Beehive') near the old Vaugirard slaughterhouses of Montparnasse. In 1915 Lipchitz introduced Soutine to Amedeo Modigliani with whom he developed a strong friendship. During the First World War Soutine enlisted in the work brigades but was soon dismissed on health grounds, having developed the stomach problems which would later kill him. His oeuvre includes a series of powerful, visceral landscapes and an important series of Rembrandt-inspired beef carcasses painted in a characteristic, expressionistic style. The American collector Albert Barnes bought a significant amount of Soutine’s work in 1923, affording him financial stability for the first time. He held his first solo exhibition at the Galerie Bing, Paris in 1927. In 1928 Waldemar George published the first monograph on Soutine as part of 'les artistes juifs' series; Elie Faure's followed a year later. From then Soutine worked mainly in Paris, spending the summers near Chartres with his patrons Marcellin and Madeleine Castaing. After 1941, using a false identity card, he sought refuge from occupied Paris in Touraine, but in 1943, suffering from a rapid decline in health, returned to Paris and died following an operation for perforated stomach ulcers. In Jeune Servante (Waiting Maid) Soutine focuses on a single subject against an unadorned background, an anonymous, working-class figure in uniform painted with typically expressive and tactile brushwork. The painting also has a second title, La Soubrette (referring to a coquettish character derived from operetta), which - possibly to encourage sales - was given when the work was offered for sale in London in 1938 in a show entitled The Tragic Painters at Alex, Reid & Lefevre Ltd., when it was also dated to c.1925, although the original title seems closer to the artist's intentions. 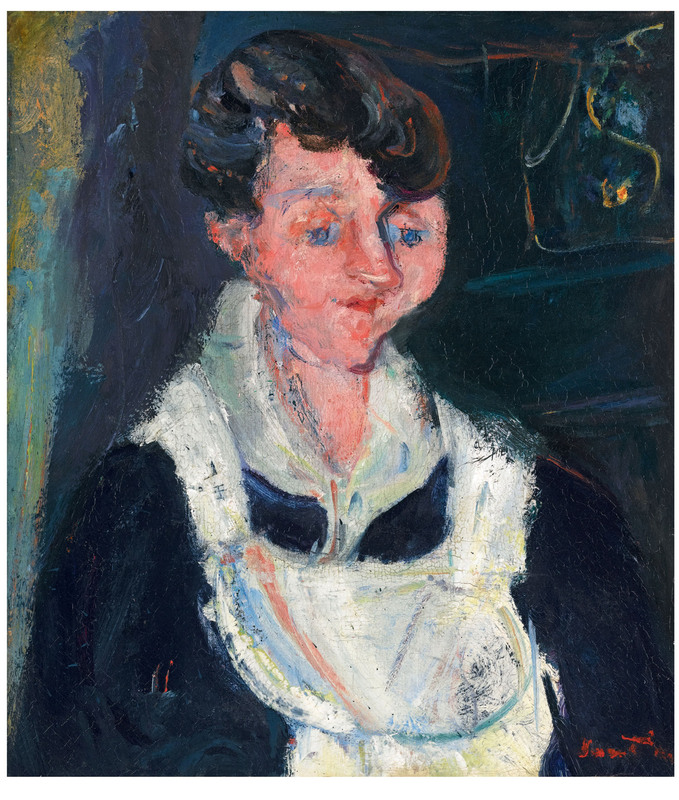 Working direct from the life, Soutine captured an expression somewhere between weariness, wariness and submission, but drew attention to the maid’s inner life by emphasising her individuality. His virtuoso paint handling illuminates her white apron with a dazzling display of colour. This portrait relates to Soutine’s series of powerful character studies of pastry cooks, choirboys, boot boys, bell-boys and maids, dressed in the uniforms of their professions, in exaggerated poses ranging from awkwardness to arrogance. From the 1930s Soutine’s figure paintings became less frenzied and more meditative. La Soubrette was unveiled in 2012 at the exhibition, From Russia to Paris: Chaïm Soutine and his Contemporaries. It is one of only seven Soutines in British museum collections.